So I tweeted about this recently as I'm bonkers about baking this particular gluten free cake. There are all manner of versions of it - clementine, orange and lemon - but I believe the original is best. It really is the easiest cake that you'll ever bake. The main thing is boiling the oranges for two hours in advance. I often do that the night before I bake, so everything is ready to go. 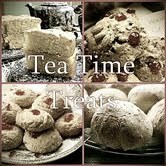 I'm updating this for the Tea Time Treats challenge by Karen at Lavender and Lovage and Kate at What Kate Baked who are looking for citrussy bakes this month. Equipment: 1 x 10 inch springform cake tin Electric hand held blender or potato masher if you don't have one Large bowl, preferably with high sides. Oven: 180 degrees or 170 for a fan oven. Cakes generally like to be cooked 'slow and low'. Method: ***Boil the oranges in a saucepan filled with water for two hours. You may need to replace some of the water so they are always covered. Allow to cool. If you're in a hurry you can cool them down with cold water after the boiling time is done. ***Dust a sprinkling of caster sugar on the base of the cake tin, this will allow you to get the cake out without it sticking. ***In a large bowl, quarter the oranges and remove the green part from the tops. Add the sugar and with a hand held blender, mix until liquid. ***Add the eggs and blitz again until mixed well. ***Add the baking powder and the almond and blitz again until you get a runny looking cake mixture. ***Bake for about 45-50 minutes or until golden brown on top. ***Remove from oven and allow to cool for ten minutes before running a knife around the tin and underneath the cake where you put the extra sugar. Place on a large serving platter or cake stand and allow to cool before dusting with icing sugar and eating. It's a pleasure and I just love this recipe, sweet yet tangy too and unbelievably light for a cake so it feels virtuous (almost), good luck with the challenge this month! Most beautiful cake. I am going to Pin this recipe, so lush. when u boil the oranges, should they be completely peeled? do u use blanched almonds? No need to peel the oranges, just remove the hard bits on the top, the skin goes super soft after all that boiling. For the almonds I just use ready ground almonds.